Leading manufacturer of winter service fleet, Econ Engineering,has announced it will be hiring 20 new staff after seeing a boost in orders for its vehicles following the Beast from the East. Econ, which already produces around 80% of all the salt spreading vehicles used on the country’s roads, is introducing a full night shift at its Ripon manufacturing base and the £30m turnover family business is currently recruiting 20 new staff to satisfy the upturn in work. A full variety of roles are on offer in the vehicle production process including skilled fitters, welders and painters. Econ sales director Andrew Lupton said: 'We are boosting production of our iconic Econ snow clearing and pot hole repair vehicles to meet the huge demand from our customers throughout the UK. 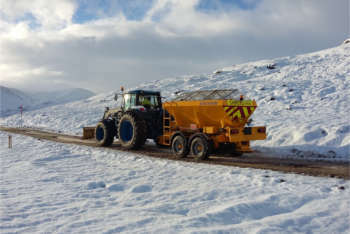 Councils are now in the process of patching up and repairing the roads after the ravages of a long cold winter – as well as planning ahead for what next winter may bring. 'With orders across the board up on this time last year, we have decided to introduce a night shift at our factory in Ripon and are now looking for a further 20 enthusiastic people to work either day shifts or four nights a week with highly competitive rates of pay.